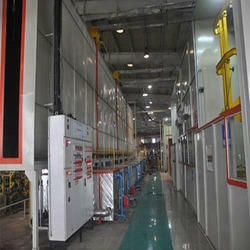 Our range of products include spray pretreatment line. To meet the diverse requirements of our clients in the best possible manner, we are manufacturing, exporting & supplying a comprehensive assortment of Spray Pretreatment Line. Offered tunnels are manufactured by our skilled professionals using the best technology to render maximum clients' satisfaction. In order to meet variegated demands of clients, this is made available in various customized options. Besides, clients can avail this product at market-leading prices. Individual Spray Zones for each Process. High-Pressure Cleaning of the Parts. Processes can be heated to enhance the process. Looking for Spray PT Line ?